Galibore is located deep in the deciduous forests of cauvery wildlife sanctuary. Located at a distance of 10 kms from Sangam. A perfect place for nature lovers and anglers. They have identified over 200 species of birds consisting of tawny eage, pied crested cuckoo, darter etc. Some of the mammals are also spotted here. 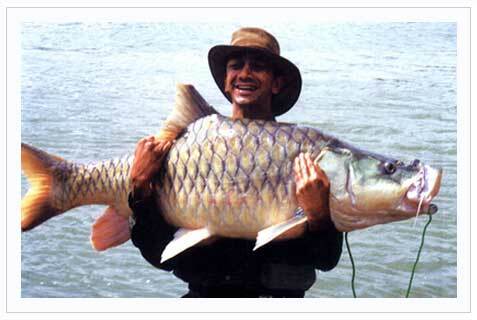 Mahseer fish is the main attraction here. Activities include coracle ride, trekking, joy fishing, lazing on the hammocks, angling, bird watching. It is a perfect place for corporate offsites and outdoor training programs. River rafting is also possible. Season: June to Aug is a perfect time, when it is lush and green. Angling season starts in mid december and continues upto may. The above tariff is valid from 1st Feb 12 till 15th Sep 12. Tariff is per person per night on twin sharing basis. Check in 12 noon & Check out 11 am. Cost includes stay, all meals, coracle ride, joy fishing, guided trekking, campfire, forest entry fees, camera fees & taxes. Children below 5 years of age complimentary. Children between 5 to 12 years will be charged at 50% of the tariff. Children above 12 years considered as an adult. Single occupancy supplement charges will be 1100/- per tent for indians & 1700 for foreigners. Cancellation or postponement of booking, subject to hotel rules. Angling will be extra at Rs. 1650 per person for indian, 3700 for foreigners. Guests should bring their own fishing gear. River rafting charges are extra. Bangalore to Kanakapura, then to Sangam. 100 mts. before sangam, take right to galibore which is another 9 kms. A vedic ashram called " Om Shanthi dhama" is another land mark enroute.